I have written about the air pollution in Yichang before on the blog The Corner here ( Sunny days never make headlines ) and here (haze over Yichang) and here (Night Fog). There have occasionally been days with thick haze in Yichang. We are never exactly sure how much of it is the mist rolling in from the cold lakes and reservoirs that dot the area and how much of it is the same heavy pollution that seems to be everywhere in mainland China. Clear air in the morning from my balcony. There are so many things that I like about Yichang that I was able to ignore the pollution levels that now seem to be out of control. Over the first three weeks of January, Yichang was choking on an incredibly high level of air pollution. Children were not allowed to play outside. My colleagues complained about burning eyes and persistent coughs that they claimed were just colds. I developed an access on my neck and then another and then a third. Below is a photograph of the weather for January 19th showing the particle matter( PM) in the air. PM 10 is larger particle matter. PM 2.5 is smaller matter. The air quality was consistently like this for the entire month up to that point. There was lots of discussion on on-line forums about this problem and its cause. Many people look to the current construction projects which include demolishing nearby hills to make room for development projects. To the east of downtown one can witness the sheer scale of this project as one leaves town for the high-speed railway station. Since 2012 Yichang has been connected to Beijing, Shanghai, Guangzhou, and Chong Qing and Wuhan. Previously a train ride to the provincial capital (Wuhan) took 5 hours. Now it takes but two. 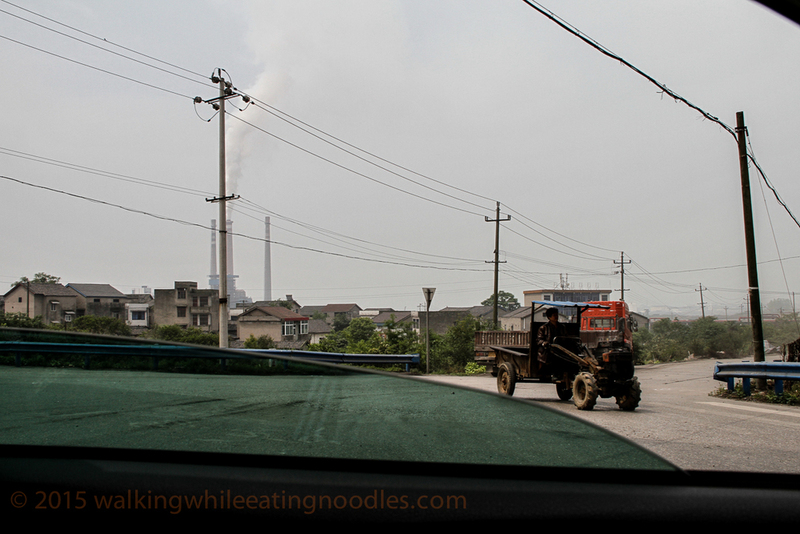 In 2009 I travelled from Guangzhou to Yichang. It took 16 hours. Yichang to Guangzhou now takes only four hours. The development is welcome but whether or not this development is connected to the pollution is another matter that remains unanswerable. What is answerable though is why has the pollution been so much worse now than ever before. Simply we have not had rain in weeks. My guess is that pollution output is timed with expectations of rain. Yichang's consistent and cleansing rain is one of the reasons I love living here. But the rains also make it easier for industries to pollute and remain out of the public eye. When predictions of rain would fail and the pollution would not wash away so quickly, the city would be engulfed in haze, leaving the entire city choking for weeks. That is what happened this month. Once the rain finally did arrive, it came in weak sprinkles. The air did not clear up but smelled like a wet dirt road. I have been able to ignore the toll pollution takes because up until recently I have not felt the effects. The boils on my neck have since subsided and I no longer need to take medicine but I ought to regard the health scare as a serious warning. One generation plants a tree; another generation waters the tree; the third generation enjoys the fruit and shade. If this is the wisest and most moderate viewpoint that can be applied to this situation than I might was well leave. I don't expect to be here long enough to watch my grandchildren enjoy whatever fruits can be raised from the sunless days of my most productive years. I have no say in this process and even if I did have a say I am uninformed as to the causes and real purposes of this method of development. The effects on the air are the most apparent. While frightening, the effects in the water, soil, and food supply are less apparent. Most people I have talked to mention the endless construction in the city. They talk about the demolition of mountains. They talk about the lack of rain. There is even reports (like this one here at xinhua news) that mention claims that bacon is causing the pollution. Smoked meat is a regional food in Hubei. Unlike bacon in the west, Chinese bacon 腊肉 is not simply cured bork belly and it is not refrigerated. A fire pit in a farm house. La Rou 腊肉 is typically stored above the fire. What they didn't talk much about were the coal burning power plants in the town east of Yichang called Xiao Ting. 40km up river is the world's largest hydro-electric dam--the Three Gorges Dam. Sadly, a few kilometers downriver from Yichang is a town called Xiao Ting. I know about Xiao Ting because last April I was invited to go strawberry picking with some friends. Remembering a previous trip across the river to a flower nursery and greenhouse, I was excited to pay a flat fee so that I could fill a basket with as many plump red strawberries as I could. Rather than crossing the Yiling Bridge, we continued east past the railway station to Xiao Ting which was a sight that I could not imagine and which explained a lot about Yichang's pollution. 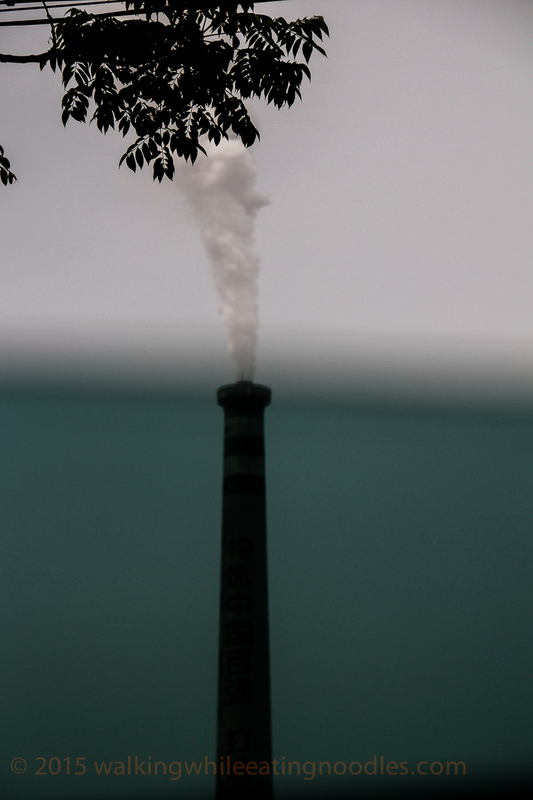 Tall smokestacks funneling plumes of smoke which quickly disappeared into the sky. Heavy trucks covered in the earth that they were meant to move and soot which covers everything were parked on streets devoid of much life in front on vacant buildings. We came here to pick strawberries (?) This area was not fit to grow anything and certainly not delicate skinless fruit. When you live in a place that is heavily polluted normal takes on a new meaning. Children will tell you today is a sunny day when in fact the sky is a milky grey and your eyes burn and burning things don't smell because everything already smells of burning. Leaders will be ever cheery and tell you it is a sunny day. Begging for reason, you point out to them what apparently a child cannot understand and they will remind you that above the haze the sun is shining. While technically right, they have been looking through the looking glass so long that they have confused logic with reason and reason with logic.